The California Box Elder is a fast grower to 50 ft. It has shallow lobed leaves, light green with a velvety texture.The leaves turn yellow in the fall. This species tolerates wind and heat, although it is usually found near a water source. Greenish yellow flowers appear in pendant clusters in spring and interesting seed pods provide a pleasant rustle in the breeze. 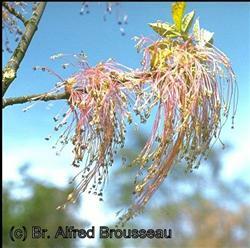 Select a male tree if you might be offended by the mess of the flowers or seed clusters. This is a good shade tree for those difficult corners of the landscape where other trees are hard to grow.